2017 was quite the year for the Aberdeen IronBirds. Rarely, if ever, do you see a season begin, AND end with rainout games, but here in Aberdeen we saw both. This year we had one of the better teams in recent memory-only missing the playoffs by 2.5 games and finishing the year with 41 wins-tied for the most wins in the club's history. From the league-high, seven New York-Penn League All-Stars on our club, to the outstanding play from our Orioles' Players of the Month, Ben Breazeale and Michael Baumann, it was a great summer to see the future stars of your Baltimore Orioles. The 2017 season wasn't just a great season for our players-we also shared some amazing moments with our fans. Whether it was the unveiling of our new video board, our first sold-out game since 2015, or the debut of the Aberdeen Steamed Crabs, this season was a special one. To commemorate this season, we assembled a "Top 10 Moments," ranking the best of the best from this 2017 IronBirds season. 10) July 7/8 - Return of the ZOOperstars! Having not seen the ZOOperstars! since 2014, this group sure didn't disappoint. Cow Ripken Jr. dazzled fans with his dance moves on the IronBirds dugout, and Clammy Sosa had himself a little "snack" between innings. The Force was strong with the IronBirds on July 22. Jedi Knights and stormtroopers alike roamed the concourse to interact with fans of all ages. And to cap off the night, fans were treated to one of our world-famous fireworks shows after the game. While the success of the 2017 IronBirds should be attributed to the outstanding play by the entire team, the consistent and stellar play of Brenan Hanifee, James Teague, Kirvin Moesquit, Jaylen Ferguson, Zac Lowther and Ben Breazeale helped keep the IronBirds in playoff contention throughout the entire season. Not only were the seven All-Star nominations a league high for the 2017 season, these seven nominations were the highest in team history. During the month of August, Michael Baumann really carried this IronBirds team. Over the entire month, Baumann threw a total of 25.2 innings while surrendering just two earned runs. Baumann would finish the year with 41.1 innings pitched and a miniscule 1.31 ERA. What better way to celebrate the birth of our great nation than with our national pastime? That combined with an IronBirds win and a post-game fireworks show made this past 4th of July one that we won't soon forget. From the get-go, Breazeale came out of the draft swinging a hot bat. In the month of July, the IronBirds' catcher slashed .390/462/.550 with two home runs and 10 doubles. The sweet-swinging lefty was a staple in the middle of the IronBirds lineup all season, finishing the year with a .318 batting average, five home runs, and 32 RBIs. Having thrown his last pitch at Ripken Stadium back in 2007, IronBirds fans were in for a special treat when Zach Britton, now the closer for the Orioles began his rehab assignment with the IronBirds on Opening Night. DaDaDa DaDaDa! Isn't that a sweet sound? T.J. Nichting's Jeter-esque catch at Tri-City this year was one of the most jaw-dropping catches that we've ever seen. "The catch" was so spectacular that it easily won the #1 play of the day in SportsCenter's Top 10 Countdown. For the first time ever changing our team name, we couldn't have been more thrilled about the excitement surrounding the Steamed Crabs game this year. 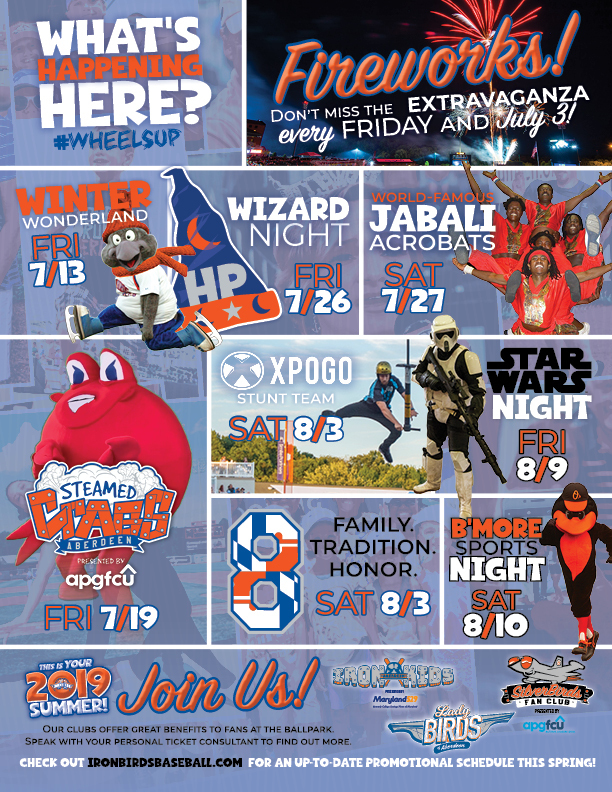 From the new uniforms and menu items on the concourse, to the debut of Kalvin the Crab, the Steamed Crabs game was one of our favorite nights of the whole season. With Aberdeen Proving Ground being such an instrumental part of the Aberdeen community, we take it upon ourselves to celebrate the sacrifice made by the members of our nation's military on Military Appreciation Night. This year's celebration was particularly special because 1) we were able to celebrate the 100th year anniversary of the Aberdeen Proving Ground and 2) we had our first sold-out game since 2015. Think we left out a moment that should've been included? Let us know on Twitter @IronBirds or Facebook @AberdeenIronBirdswhat moment should have made the cut using the hashtag #TopIBMoments.